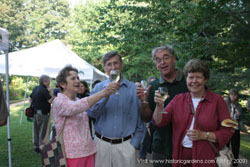 Annapolis Royal Historic Gardens ›› Experience the Gardens ›› Wine & Flowers! Imagine yourself strolling through the beautiful Historic Gardens in Annapolis Royal on a warm summer evening, sipping wine, listening to soft music, and admiring the rainbow of colour painted by hundreds of blooming roses, or day lilies. If you can do that, you've just pictured yourself at one of our special Wine Evenings. If you can do that, you've just pictured yourself at one of our special Wine Evenings. In 2009, both our July Wine & Roses and August Wine & Lilies were great successes. Please check our Calendar of Events for information on future Wine Evenings.